If you have any questions or want to enquire about dates, use our form to contact Sheila Anne Holford or see their website for more information. Heaven for horse-lovers: two large, bright, smart gites at either end of a converted coach house, with stabling in between. The friendly Holfords live in the adjoining main house on their showcase 18th-century stud farm. They are Australian and English, both vets and thoroughly hands-on with their 100-or-so well bred show jumpers. Watch them training and stroll in the impressive gardens: formal French, with lily pond and carp lake. There are also two tennis courts, a games room, and a covered (unheated) swimming pool. Indoors all is impeccable too: the look: classic, sober and uncluttered. Sturdy mahogany sleigh beds have beautifully puffed-up duvets and both French and English pillows. Attic ‘dormitory’ singles are snug under slanting beams and skylights. Almé, with spectacular overhead carpentry, has a spacious kitchen/diner and a separate sitting area looking out of arched windows. Baloubet has a first floor triple-aspect kitchen/diner leading to a balcony with more lush Normandy country views. Nearby markets provide the wherewithal to exercise the excellent kitchen kit. Major sights surround you. Exceptional accommodation in truly beautiful surroundings. A great base to explore Normandy or just relax in the grounds and enjoy the facilities. Highly recommended. We, a family group of 22, had a wonderful week at Haras du Gazon, staying in Baloubet, Cor de la Brière and Double Espoir. The younger ones loved the horses, the games room and the swimming pool. Others played tennis, cycled or walked along quiet lanes with verges full of wildflowers, played boules or sat in the sun watching the swans on the lake. The kitchens are well-equipped so cooking and eating were a pleasure with Double Espoir large enough for us all to eat together. Ann and Tim were most welcoming and helpful and maintain the gîtes to a very high standard. Anne and Tim made us very welcome and the info in the house provided lots of ideas for activities. We loved the space, the well equipped gites and the extra facilities including the play room which had entertainment for all ages. The pool and tennis courts were an added bonus. The horses were lovely to watch and very friendly. There is plenty to do in the area but it was lovely to relax too. This is the second visit to Alme for us. A plus was the wonderful Easter weather. We were able to enjoy the peace of the garden, while the children took full advantage of the pool. In twenty years of staying in gites in Normandy and Brittany, this really is the best and we look forward to returning. We had a very enjoyable stay in two of the Gites with family. Anne and Tim were very welcoming. The accommodation is spacious and comfortable. The Holfords make sure that you have everything you need for an enjoyable holiday. We would love to return. Had 8 days in Gite Balubet. Enjoyed every second. The Gite was very clean and tidy, had everything we needed. The location is excellent, up to 1.5 drive from all attraction we visited. Haras du Gazon is a great place to stay with family and friends. Our party of 9 enjoyed the pool, bikes, games room and little lake. There are lots of great day trips to do nearby and the hosts Anne and Tim were friendly and helpful in every way. The accommodation (Gite Alme) was spacious with great beds, lots of bathrooms, and well equipped. We stayed at the Haras-du-Gazon and we could not have had a more enjoyable stay. The owners Tim and Anne were most welcoming, and the accommodation was extremely well equipped, within the beautiful and extensive grounds, home to horses, swans and otters. We were provided with recommendations of activities, trips and restaurants on arrival. There was a large swimming pool, bikes, tennis racquets, table tennis, dvds etc onsite and plenty to do in the region. We'd thoroughly recommend a stay here and we hope to return soon! If you are seeking a beautiful location and comfortable, spacious accommodation to share with family or friends we highly recommend this property. Adults will enjoy the tranquility, the gardens and grounds and historic sites to visit whilst the children will love the swimming pool, games room, play area and the beautiful horses. Anne and Tim are very friendly and helpful hosts and we can't think of any negatives. it is a special place. Amazing place with great owners Tim and Anne. if you like countryside, horses, flowers, swimming pool, garden, history, books, life - that place is for you. Really very lovely place were spent time with family or friends. Specially very good book selection at English. I read about Australian experience in Normandy "French Tables", sit at nice garden and eat Camamber from nearest food market. I would love be back one day. Start to miss that place now. a lovely place, we stayed at baloubet,really nice barn convertion right next to the stables.the owners tim and annie were very helpful and welcoming,just walking around the farm was a real pleasure. our young grandchildren loved it. we will return. We stayed in Baloubet, which was lovely. The setting is very peaceful, but plenty for the kids to do. They enjoyed feeding the horses, swimming in the pool, and playing in the games room. The gite was very well equipped, and the room upstairs was good for the kids, leaving 2 couples in the 2 ensure bedrooms downstairs. Highly recommended. Perfect setting and perfect accommodation for a great family holiday. Welcoming and friendly hosts. Recommended holiday location. 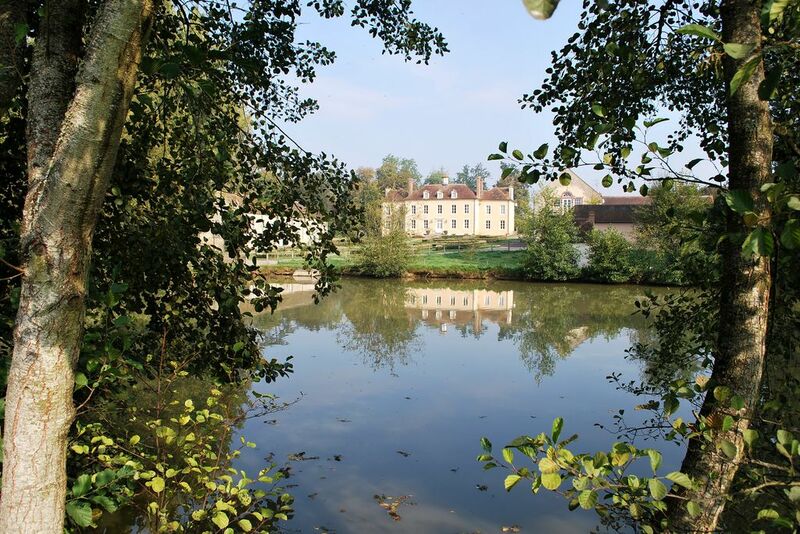 Local circular 10km walk/cycle starting at our gates and following the quiet country lanes and greenways: 'Route des Haras'- passing by our neighbour, the famous thoroughbred horse stud: Fresnay-le-Buffard. Evening boat cruise on nearby Rabodanges lake with wonderful candlelit dinner onboard. Circular drive: 'Route de la Suisse Normande' - starting at nearby Falaise and taking in the local beauty spots and natural heritage of this region on a signposted easy 75km route just to the west of the Haras. 'La Route des Saveurs' a drive of discovery of the lovely Pays d' Auge, taking in the ville de charme of historic Orbec with its famous ' Au Caneton' restarant, St Pierre Sur Dives with its The Monday market in the medieval hall, a marché traditionnel. Hire canoes or kayaks for an hour or two or perhaps half day descent of the Orne river from Thury- Harcourt or Clécy.